The world of movies has produced some wonderful relationships over the years, due to great storylines and fantastic on-screen chemistry between the actors and characters in question. However, not all of those relationships were very likely or predictable – and that’s often what makes them so poignant and beautiful. Whether it’s due to a gap in age or the characters in question coming from completely different backgrounds, some of the best on-screen relationships have spawned between characters you would never have otherwise thought to put together. In Home Alone 2: Lost in New York, Kevin McCallister boards the wrong plane as he and his family were due to fly to Miami for Christmas and ends up in New York by himself. 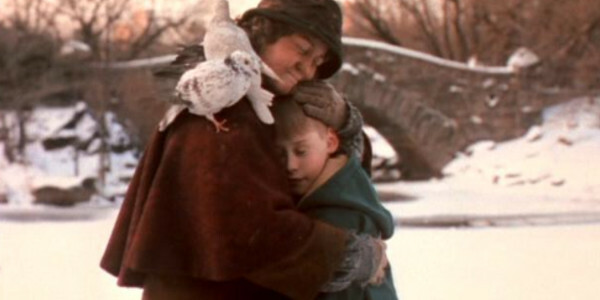 When Kevin first encounters the pigeon lady whilst wandering in Central Park, he sees her as a terrifying figure. Covered in and surrounded by pigeons, she looks like something from a horror movie. However, he apologises for his initial reaction and the two talk. He gets to know her and, when Kevin suggests that they go somewhere warmer, they go to a concert in a loft above Carnegie Hall and talk further. The pigeon lady tells Kevin about what her life used to be like. She had a job, a home and a family, but everything went wrong. She had wanted children, but the man she loved fell out of love with her and broke her heart. Whenever the chance to be loved came along again, she ran away from it, stopped trusting people and dealt with it by taking care of the pigeons in Central Park. This led to her current homeless situation. Kevin relates to her when she tells him that people ignore her when they see her and would prefer it if she wasn’t part of their city – he says that he refers to himself as the “pigeon” of his household because he’s the youngest. The pigeon lady nods in agreement and says that everyone fights for position and wants to be seen and heard, which implies that she had probably grown up in a similar family. Before leaving, Kevin promises to be her friend if she needs one and she smiles. He later returns and presents her with one of the two turtle doves given to him in a toy store, symbolising that they will be friends forever. The post 10 Unlikely (But Wonderful) Relationships That Spawned In Movies appeared first on WhatCulture!. You are currently browsing the archives for the beauty and the beast category.